Here’s another sign that Big Solar’s time has come: Silicon Valley startup Ausra is building the United States’ first solar power plant factory. When the 130,000-square-foot facility goes online in April outside Las Vegas, robots will assemble mirror arrays and other equipment that will then be trucked to solar power plant building sites in California and the Southwest. 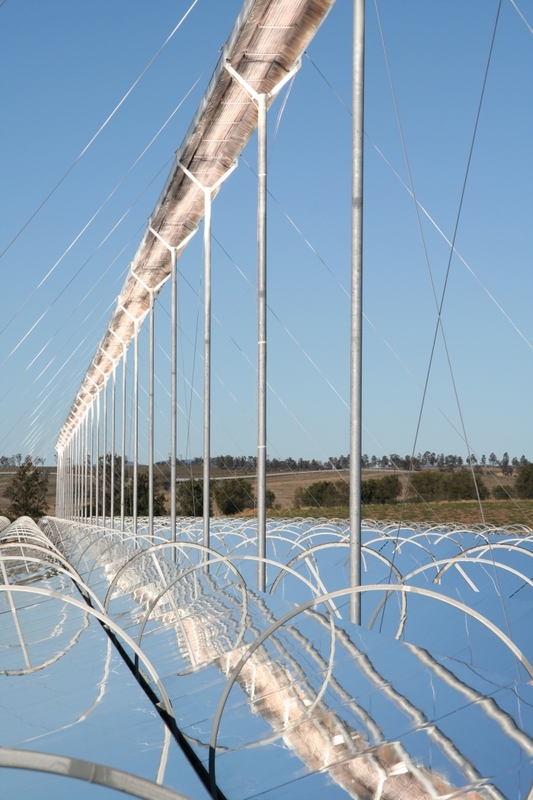 Ausra, backed by venture capitalists Vinod Khosla and Kleiner Perkins Caufield & Byers, signed a deal with utility PG&E (PCG) in November to supply electricity generated by a 177-megawatt solar thermal power station to be built on California’s central coast. Ausra will deploy large arrays of long mirrors that concentrate sunlight on water-filled pipes that hang over the reflectors. As the water is heated up to 545 degrees Fahrenheit the resulting steam drives a standard turbine to generate electricity. O’Donnell says the Las Vegas factory, located near McCarran International Airport, will employ about 50 people and be able to produce 70 megawatts worth of solar equipment a month — implying Ausra has many more big power deals on the table. Nevada’s proximity to California means that solar power plants can be built on its side of the border to ship electricity to densely populated Southern California as well as the booming Las Vegas region. O’Donnell says Nevada offered Ausra a standard package of tax incentives but nothing extra to locate the factory in the Silver State. “As the world transitions to clean energy, Nevada will be a leader in building and delivering clean power to our state, to our region, and to our country,” said Nevada Development Authority CEO Somer Hollingsworth in a statement. Nevada will get a run for its money from sun-drenched Arizona, where Phoenix-based Stirling Energy Systems plans to build factories to manufacture Stirling dishes for solar power plants that will supply electricity to Southern California Edison (EIX) and San Diego Gas & Electric (SRE). Todd, we need an article on the Energy Bill and the lack of support for Renewables therein. It could bring a halt to the growth of solar and wind in the U.S. The Production Tax Credit (PTC) for Wind Energy and the Investment Tax Credit (ITC) for Solar Energy were not part of the Energy Bill passed by the Senate by an 86-12 margin on Thursday. Wind Energy currently receives .02 cents per kilowatt/hour (kwh) of production while commercial solar projects receive a 30% Federal Tax Credit and residential solar projects receive a $2,000 federal tax credit. These credits are set to expire by the end of 2008. Without an extension of the Tax Credits, the Solar and Wind Industries in the United States will quickly grind to a halt. This will significantly impact companies ranging from Sunpower (SPWR), First Solar (FSLR), Evergreen Solar (ESLR) to General Electric (GE), Sanyo (SANYY) and British Petroleum (BP). The original Energy Bill passed in the House by a margin of 235-181 had called for a national Renewable Portfolio Standard (RPS) that would require Investor Owned Utilities to produce 15% of their electricity from Renewable Sources by 2020. It also contained an extension of the tax credits for wind and solar through 2015 at a cost of $21 billion dollars. According to the pay as you go rules of the congress, this was to be paid for by increased taxes on fossil fuel energy industries such as oil, natural gas and coal. Utilities in the Southeastern part of the country, especially utility Southern Co., strongly objected to the RPS. They claimed it would be much more difficult and expensive for them to reach this goal due to their lack of wind and solar resource. They argue that RPS legislation should be left up to the states. Currently, over 20 states have some sort of Renewable Portfolio Standard. Renewable proponents argued that countries as far north as Germany ,(the world leader in installed solar capacity at 60 degrees north latitude), are deriving increasing amounts of their electricity from solar so it should be feasible for States that are lower than 40 degrees north latitude should be able to produce significant amounts. The Bill also contained a provision for utility companies to take advantage of the 30% Investment Tax Credit which they currently cannot avail themselves of. The Energy Bill that passed the House came to the Senate Floor and came up for a vote of cloture. 60 votes were necessary. The vote was 59-40 in favor of cloture. John McCain was the lone abstention. Disappointing since solar is such an obvious choice for electricity production in his home state of Arizona. The vote went along party lines for the most part with notable exceptions of Republicans voting for cloture Chuck Grassley (Iowa), Orrin Hatch (Utah), John Thune (S.D. ), Norm Coleman (Minn.), Susan Collins (Maine) and Richard Lugar (Ind.). Democratic Senator Mary Landrieu of Louisiana, facing a tough reelection campaign next year in oil rich Louisiana, voted against cloture. The tax titles and RPS were stripped from the Bill and it passed the Senate easily. Even if cloture had been achieved, the President promised to Veto the Energy Bill that passed the House.